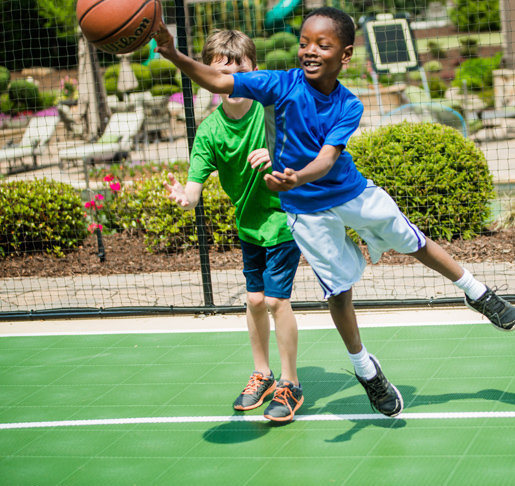 "My favorite thing about having a Sport Court surface in the backyard is the time you get to spend with the kids and play. We spend a lot more time together as a family." "Your sports flooring and certified CourtBuilder™ won my support, admiration, and approval in addition to that of the students and parents." "Last week we had friends over to play. We had a ball until the sun went down, and then we flipped on the lights and played some more. It was great to have the court to share with friends." "The outdoor Sport Court game court is doing good. It’s the sixth year that we’ve had it, and we haven’t had to replace any of the tiles. It’s important we have the longevity that the Sport Court surface provides for us so we can keep the kids active and moving around." "We have had our Sport Court® modular floor for 10 years and have had a great experience with it. 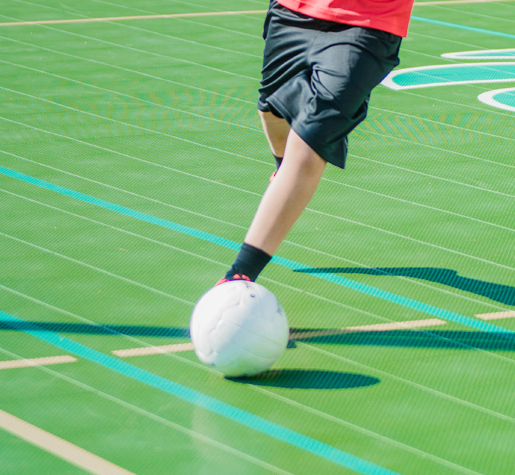 Low maintenance and great performance—you can’t go wrong with a Sport Court surface"
"Having a court provides great peace of mind knowing where my kids are, who they are playing with and what they are doing."